Image from TJ Burdick, Author, Blogger, Educator. 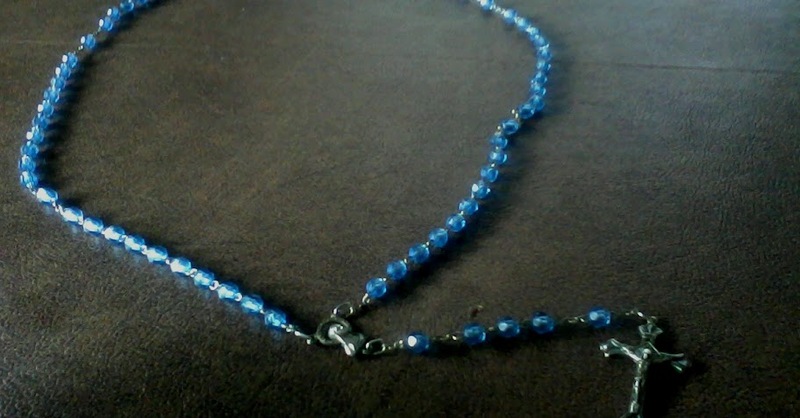 Although I spent a considerable amount of my life with the De La Salle Christian Brothers, it was not until I was in middle age and already in upper administration of a Lasallian school that I learned that there was, indeed, such a thing as a Lasallian rosary and that it has a sixth decade. How this came to be was because of either of two reasons: a) I had forgotten; or b) we were never told that there was such a thing as a Lasallian rosary. I am rather inclined to think more of the second as the real reason because, growing up in a Lasallian school, whenever there was community praying of the rosary it was always with the conventional five decades. While as elementary students we acquired – nay, made to acquire – the habit of having a rosary always conveniently stashed inside our pockets, it was always the conventional rosary. The Holy Rosary web site defines a rosary as a crown of roses; and each Hail Mary symbolically represents a rose offered to the Blessed Mother to create this crown. To all other Catholics, this crown consists of 53 Hail Marys, with meditation before every decade, depending on the day, on the joyful, sorrowful, luminous and glorious mysteries of Jesus and Mary. The Lasallian rosary, on the other hand, has 63 Hail Marys. This rosary is prayed conventionally for the first five decades; i.e. with meditation, depending on the day, on the mysteries leading to salvation of the lives of Jesus and Mary. The obvious question, therefore, is the purpose of the sixth decade. Brother Gilles Beaudet, in his paper entitled “St. John Baptist de la Salle and Marian Devotion,” says that the Lasallian Rosary is also known as St. Bridget’s Rosary. The 63 Hail Marys, he continues, honour the supposed 63 years in the life of the Blessed Mother. I once asked a Christian Brother if any mysteries were meditated upon prior to the sixth and last decade of the Lasallian rosary. His reply was that the sixth decade should be prayed for personal intentions. The best historical insight, however, is offered by Brother Peter Killen of the St. Joseph’s College Institute of Buffalo, New York in his paper entitled “Communal Prayer in the 1718 and 1987 Editions of the Rule of the Brothers of the Christian Schools.” He cites an insight from the Lasallian historian Brother Clair Battersby. The custom was begun by Olier at the Society of St. Sulpice which he himself founded. The society established seminaries throughout France, one of which was attended by St. Jean Baptist de la Salle. Thus, the historian Battersby surmised, the six-decade rosary was the method with which de la Salle was trained and likely the method he taught the first Lasallian Brothers. Although I pray the rosary every day, the sheer repetitiveness of doing so often means that I have the utmost difficulty in concentrating on the entirety of the prayer even with just the conventional five decades. Thus, in all candour, I do not think I am capable of that additional decade even if I spent most of my life as part of the Lasallian movement. There is also the likelihood that the sixth decade was practised among the Christian Brothers alone. I understand from the personal blog of a young Lasallian that the rosary is now given to students to welcome them to the Lasallian family. This was certainly not the case in my youth.